Copy of Medical Insurance – if the student is with Student Guard then they are covered for US travel; however, if they have their own insurance they need to check with their parents/agent to ensure they have coverage in USA. At the US border, complete the Visa Waiver Program Form I-94W (green) and have US$10 fee ready. 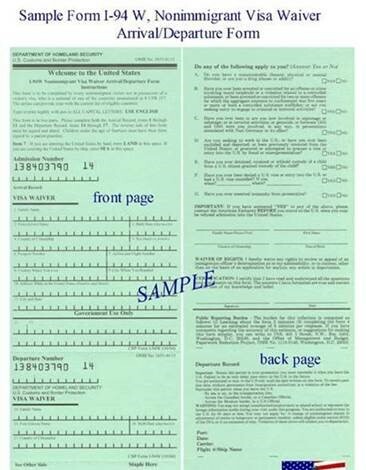 Below is the sample of the form. It is important to have the bottom piece stapled onto the passport. THE STUDENT/HOST MUST make sure that the bottom part of the I-94W form is given back to the Canadian Border Patrol UPON RE-ENTERING CANADA unless they are planning to return to the US within 90 days. If they are not sure, they should return it or else they will not be allowed to re-enter the US after it expires. Apply for the ESTA Visa Waiver (minimum 72 hours prior to travel) online. The host family can guide the student to complete the simple online form. Write down the Application Number. In most cases the electronic system for Travel Authorization will provide instant status on application. In other cases, an answer will be returned within 72 hours. You are authorized to travel to USA under the Visa Waiver Program only if your travel authorization is APPROVED.